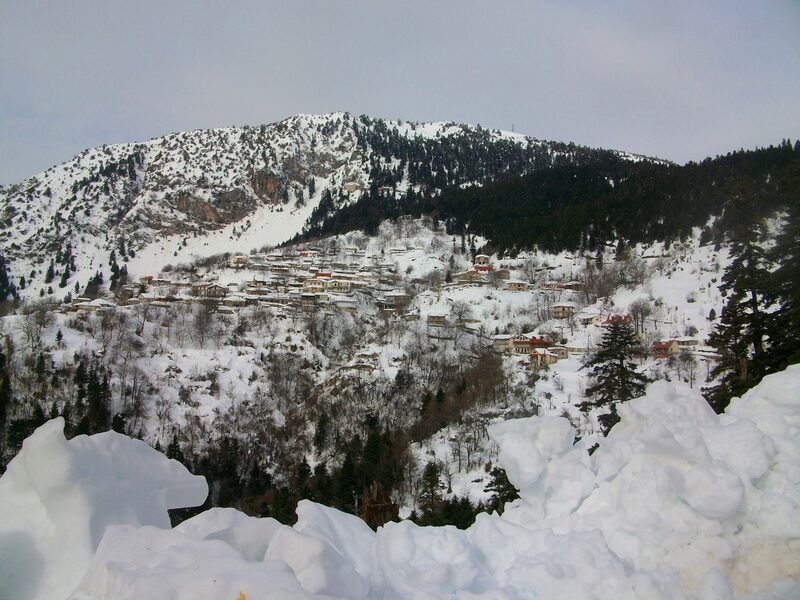 Karitsa Dolopon is one of the oldest villages of Nevropoli with Neohori and Kerasia. It is about 46 Km away from Karditsa and it is built on an altitude of 1180 m. in a forest and at ground with steep slopes. Today Karitsa Dolopon belongs to the Municipality of Plastiras Lake of Karditsa and the settlements of Agia Marina (Plakoto), Longa, Mega Rema, Rafina, Agia Paraskevi (Paiseika), Choliano (Petroto), and Mega Rema belong to it. The residents are locals and highlanders and some of them are Sarakatsanoi. The permanent residents during the winter are 30 and their number increases at the summer months to 1.000 people. Their sources of income are farming, agriculture, beekeeping, the orchards (walnut, chestnut) and forestry occupations. 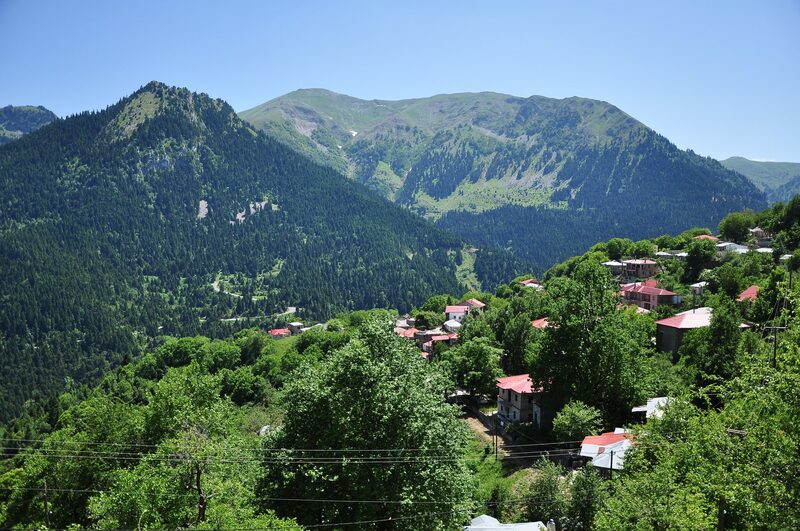 The village is located in the same area since the Byzantine times. At “Paliohori” that is near by Karitsa and near the river, there was the settlement of the ancient Dolopes. Judjing from the surface findings it could be said that the settlement is dated back to the 3rd BC. In an ecclesiastical book there is a witness about its destruction in 1823 by Moustai Pasha of Skodras. The construction of houses at Karitsa follows the standard architecture that characterizes Agrafa. The village was burned in 1943 by Germans because of its participation in the Greek Resistance and the operation of the EAM’s printings. A few stone and storey houses have been rescued. The Monastery of Panagia Pelekitis is an important historical, religious and architectural monument of the region. Its distance from the village is about 1Km and it is placed at an altitude of 1.400 meters. It was probably built before 1500 AD and it was hagiographied in the 17th century. In 1939 the monastery was declared as a historical monument. The parish church of St. John the Baptist at Karitsa was built in 1904 in a place where formerly was a church. The cave of “Gakis” with stalactites and stalagmites, remains untapped. The most important cave is the two-storey cave of Kaimakias at Mega Rema from where the river Karitsiotis spings from the famous springs. There are the peaks “Bourlero” on 2.032 meters and “Karamanolis” on 1.700 meters with a beautiful view of the lake. Karitsiotis river that its length is a few kilometers long flows in a ravine of unique beauty, through firs, platanus and willows. There are also small trouts and whitefish in the river. The stone fountains that are promenades, are very famous. The whole area of Karitsa Dolopes is covered by very large public forests of fir, oak and beech. A big two-day festival with many visitors is held every year in the 15th of August at the village square. On the 23th of August and on the 8th of September there are conducted two other festivals at the church of Holy Mary at Mega Rema and at the chapel of Pelekiti with religious character. The Association of Karditsa named “Holy Mary of Pelekiti” and the Rafiotes and Paisioi Association of Karitsa are based in Athens.